....just happens to be a veterinarian. 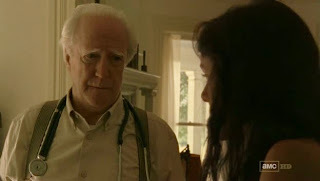 On the second episode of The Walking Dead, titled: 'Bloodletting', we were introduced to Hershel Greene, played by veteran character actor, Scott Wilson. We see Rick running across a field carrying his son, Carl, in his arms, because the boy had been shot when a bullet passed through a deer that was being hunted by Otis, Hershel's farmhand. Rick is seen approaching the farmhouse by Hershel's daughter, Maggie, who then yells for her father. Hershel comes out onto the porch and the first thing he asks Rick is, "Was he bit?" ....that is certainly not an unusual question to ask someone since the 'fever' has taken over our world. When Rick says that Carl had been shot, Hershel orders Rick to, "Get him inside...INSIDE!!!" The farmhouse becomes an ER, with the good doctor telling his family to get him the medical necessities (painkillers, coagulants, alcohol, iv fluids) that he needs, in order to save Carl. Carl will need a blood transfusion, and it's fortunate that Rick is the same blood type as his son. Hershel tells Rick, "Don't wander far, I'm gonna need you." Hershel discovers that the bullet has broken into fragments...six to be exact...and that he would have to perform surgery in order to remove them. Carl is also bleeding internally...a bullet fragment nicked a blood vessel...so Hershel would have to go in and find the bleeder, and stitch it up. Hershel is highly capable of performing this life-saving surgery on Carl, except he needs a few things; a respirator to keep Carl breathing while he is under anesthesia, sutures, drapes, and extra surgical supplies. Now where to get these items, since the hospital had burned down. It is suggested by Otis that they could be found at the high school, because it had been turned into a FEMA shelter. Otis and Shane go on a mission to the high school, to get the medical supplies needed in order to save Carl. In the meantime, Maggie went out to find Lori, and she brought her to the farm. And as any mother would be upset, over what had happened to her child, she wanted to be sure that Hershel would be able to perform this surgery. "You've done this procedure before?" "Well yes, in a sense." I totally understand her concern. It's not out-of-line for one to question a physician's capabilities. "Yes mame, of course. A vet." "A veteran? A combat medic?" Total shock came over Lori's face, and I thought for sure that Rick would pass out, in fact he did fall into the chair. "And you done this surgery before on what? Cows? Pigs?" Ok Lori, we get that you have an issue with Hershel being a veterinarian, but don't be snarky with the only one who is truly capable of saving your son! I doubt very much that you would be able to find a 'people doctor' in time, so a highly qualified vet is what you get. As it turned out, the surgical items that Hershel needed, were indeed found at the high school by Shane and Otis, but not without tragic results...we all know what happened, so I will not go into that right now. Hershel was able to operate successfully on Carl. So never underestimate the knowledge, or skills of a veterinarian...especially in a post-apocalyptic zombie world. Nice first post Doris, if you want you can be our official Hershel Greene author for now, after all you are a massive fan of him! Good job Doris!! Nice read! Love ur post! Love this page! Please don't take this personally, cause I'm a little OCD !AND! southern born and bred (weird combo, I know) but we spell it m-a-m, no e. Still love this page though!